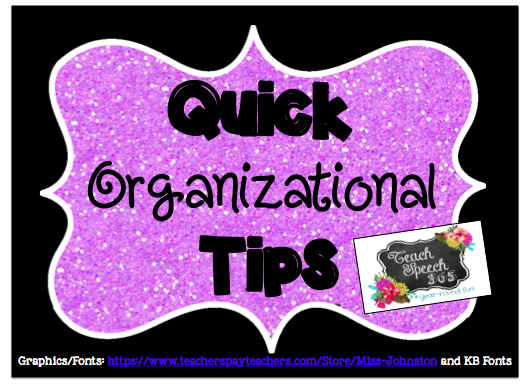 I’m popping in share a few of my tips on staying organized during the busy times of the school year. We all know that organization can fall by the wayside when life gets crazy. For me, even just having some semblance of order helps my stress levels. 1. Clean off your desk at the end of each day: I like to do this because then it feels like you’re starting fresh the next day. 2. Use post-its: When I have a lot on my to-do list, I tend to write down a few items on a post-it and stick it to my desk. This can mean I have a lot of post-its at any given time, but I get great satisfaction out of unsticking it and throwing it away when I’m done. I realize this may not be the most earth-friendly solution, so I also utilize the sticky note function on my computer desktop. 3. Do your schedule on an Excel sheet: This makes it easy to go in and change kids around (I don’t even want to think about how many times I’ve changed my schedule this year). 4. Ziploc bags: I have seasonal activities in big 2 gallon ziploc bags. This makes it easy to grab at the beginning of each season and decide when I want to do each activity. Feel free to email me at teachspeech365@gmail.com with any questions. Find me on Facebook, Pinterest, Instagram, or Teachers Pay Teachers!